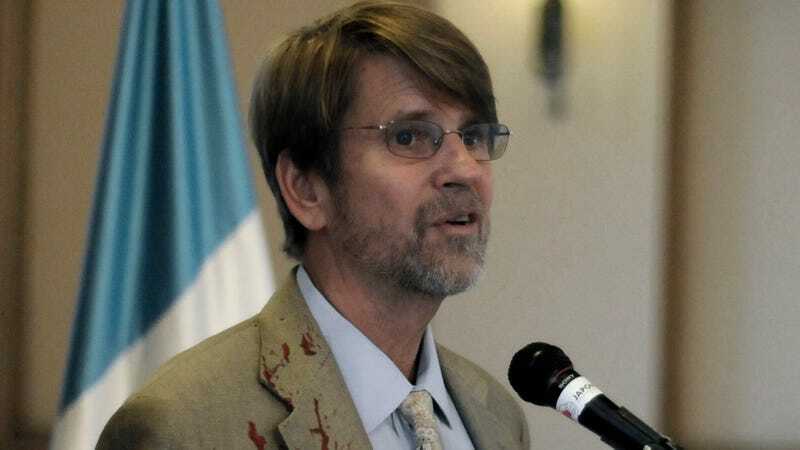 ANGERS, FRANCE—Expressing their contrition over the unfortunate incident, a team of archeologists from the Smithsonian Institution held a press conference Friday to apologize after discovering the last remaining Neanderthal and then immediately murdering him in a fit of crazed bloodlust. “The entire team is deeply sorry for tarnishing the historic discovery of a living Homo neanderthalensis by flying into a berserk fury and pummeling him to death with our shovels and trowels,” said lead researcher Lisa Rosen, noting that shortly after catching sight of the archaic human’s short legs, stocky build, and sloping forehead, all the nearby scientists were seized by an inexplicable and overwhelming urge to kill. “There is a lot we could have learned about human evolution from the final extant Neanderthal, and so repeatedly bashing in his skull represents a significant loss for our field. We regret our actions, and we regret further compromising this discovery by destroying the Neanderthal’s tools, personal possessions, and, indeed, all trace of his culture in a frenzy of homicidal rage. Our behavior was completely unprofessional and unacceptable. We apologize to the Smithsonian, to our backers, and to the scientific community at large. You deserve better.” At press time, the numerous photos taken of the Neanderthal had been lost after those assembled began emitting guttural war whoops and swarming around the camera to smash it with rocks.